If you have a very active canine friend, whether that’s a working dog or a growing puppy, then he or she needs the right levels of protein in their diet. That’s a fact that can’t be contested. The benefits of such a diet are that the high protein levels will supply your dog with the essential nutrients required to build muscle and give them a healthy skin and coat. It will also improve their natural energy levels, giving them the calories that will keep them on-the-go during sustained periods of exercise. High protein dog foods also mimic the diet your dog’s ancestors would have had, when they scavenged for food sources that would have offered them the higher levels of protein they needed for energy to survive in the wild. So with that in mind, here we look at some of the best dog foods on the market that will satisfy their bodies’ needs for high protein. 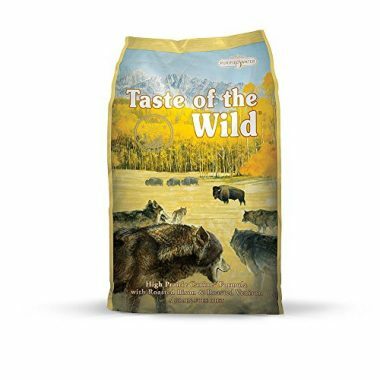 Containing a minimum ratio of 32.0% protein, Taste of the Wild Grain-Free High Protein Natural Dry Dog Food is one of the top-selling high protein foods designed for active, healthy dogs. As it’s grain-free, it’s eminently suitable for dogs that are allergic to grains or owners who want their pet to have a more natural diet. The formula is made with high percentages of real, lean meat and contains supplemental fruits and vegetables to contribute antioxidants which promote a healthy lifestyle. It also contains omega-6 and omega-3 fatty acids for a shiny coat and healthy skin, as well as species-specific probiotics to boost the immune system and aid digestion. 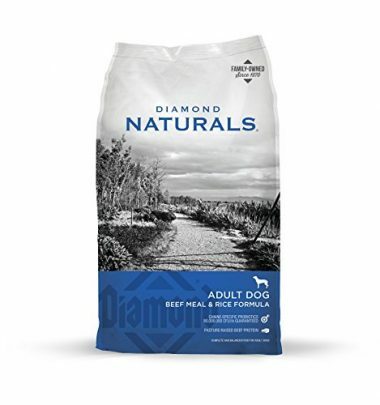 Specially designed with ageing dogs in mind, the Diamond Naturals Natural Pasture Protein formula contains the optimum level of protein balanced with appropriately proportioned fat levels to support a healthy body. Glucosamine and chondroitin is added to promote strong joints; while higher than average levels of fiber and built-in probiotics aid digestion, even in dogs with delicate stomachs. The high levels of protein in this product derive in part from pasture-raised beef, and there’s no filler, artificial colors, flavorings or preservatives either. 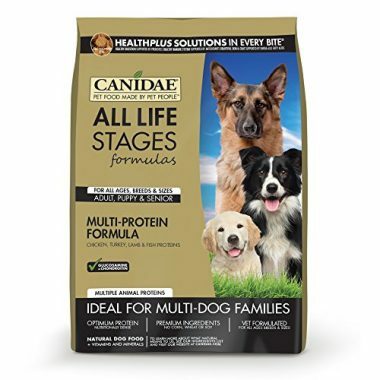 CANIDAE All Life Stages is an all-round, all-purpose dog food, suitable for any breed, age or size of dog. 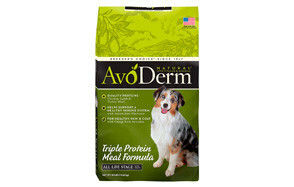 Formulated by vets, the formula doesn’t contain any fillers like soy, corn or wheat. Instead, it is includes high levels of optimal proteins such as chicken, turkey and lamb meal. It’s nutritionally dense, so your dog can gain and digest all the nutrition he needs from less food, meaning less waste, less expense. Because it’s suitable for almost any canine, it’s great for households with multiple dogs too. 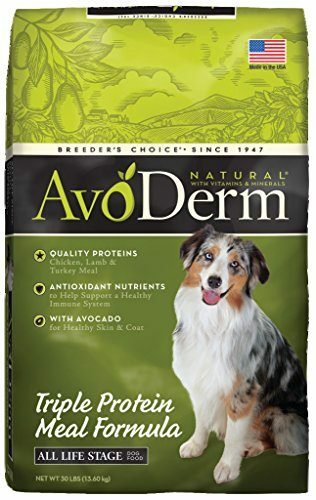 Avoderm’s Natural Triple Protein dog food contains high-quality proteins from chicken, lamb and turkey meal. It’s guaranteed free from wheat, corn, and soy – a positive for pet owners worried about their dog’s grain intake or dogs with allergies. California avocados are added to the mix to assist in the promotion of a shiny coat and healthy skin, and to give the immune system a boost. With no artificial flavorings, colorings or preservatives, it’s natural throughout and has been formulated to meet the nutritional needs of dogs at every stage of their lives, from puppies to the aging canine. 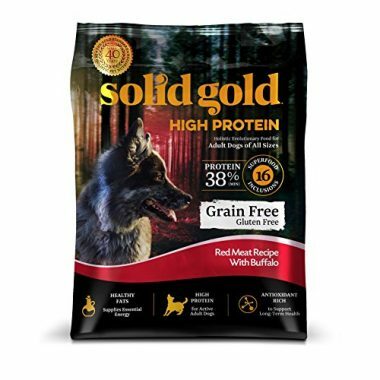 Suitable for adult dogs of any size that have an active lifestyle, Solid Gold High Protein Dry is a complete dog food that provides your pet with everything he needs for good health. It includes Omega-3 and Omega-6, which maintains a healthy coat and skin as well as supporting a strong immune system. Gluten-free and grain-free, the high levels of protein balanced with 16 essential nutrients and a low-carb recipe will keep him active and fit for anything. 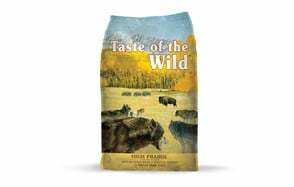 Real beef and buffalo meat ensure it will appeal to his taste buds as well as delivering high quality nourishment. 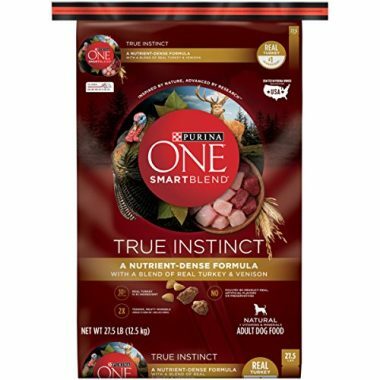 Suitable for adult dogs rather than puppies or pregnant and nursing mothers, Purina ONE SmartBlend True Instinct is a dry dog food that can be mixed with water (one part liquid to four parts feed) if your dog prefers. It’s a complete formula, meaning no additional supplements are required. The top ingredient is real turkey and there are no artificial flavors or preservatives. Glucosamine assists in the maintenance of healthy joints while Omega-6 ensures healthy skin and a shining coat. 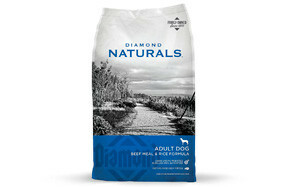 The formula is rich and dense in nutrients and easily digestible, so your dog derives the maximum benefit from his meal. 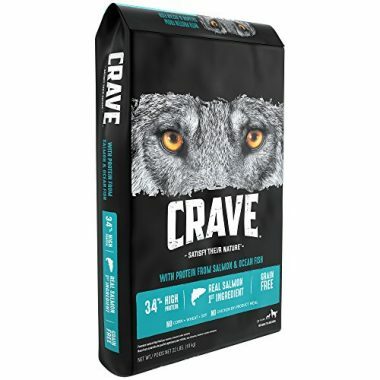 Salmon and chicken meal are the top ingredients in CRAVE Grain Free High Protein Dry Dog Food. There are no meat by-products included, nor are soy, corn or wheat added to make up the bulk. Carbohydrates come from quality sources such as chickpeas, and with no artificial colorings, flavors or preservatives either, this natural formula is suitable for adult dogs of any breed. High in protein at 34.0%, this food gives your dog all he needs for a healthy, lean body, bags of energy and a strong immune system. 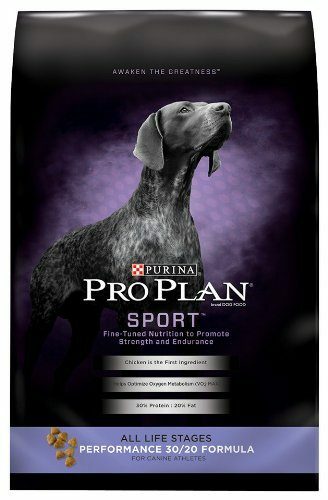 Purina’s Pro Plan SPORT is suitable for dogs at any life stage, from puppy to senior. The balanced formula of 30% protein to 20% fat ensures your dog is getting the right mix to feed his metabolic requirements while promoting and maintaining lean muscle mass. Rich in antioxidants, the food helps promote a healthy immune system, while Omega-3 aids mobility by supporting healthy joints. Animal protein - real chicken meat - is used as the primary ingredient and the formula delivers concentrated nutrition to fulfil all your dog’s needs and support his activity levels. You may look at all the information above and begin to panic. How can anyone but a veterinary nutritionist with years of experience choose between all these options? The answer is to do your own research and know your own dog! Your vet will also be able to offer advice, especially if your dog has an existing medical condition or is overweight. Here are a few guidelines to get you started. In order to choose the right high protein dog food, you need to understand what’s typical for the average dog. Vets recommend that the average content in terms of protein in a complete diet should be between 20% and 30%. At 30% or above, a pet food is considered to be high in protein, so anything that contains 20% or less is classified as low. The average pooch requires somewhere in the middle. No matter whether you want to feed your pet a high or a low protein diet, it’s important to look for animal proteins in the ingredients list. Where proteins derived from animals is the primary source of protein in a dog food, you know that they will be easier for your dog to digest. This means maximum benefit, less waste from undigested proteins. Check the ingredient list carefully – these are always listed in order of the percentage of each ingredient contained from highest to lowest – and expect the top listed items to state chicken, beef, lamb or fish. The generic term ‘meat’ is no guarantee of quality. Like all animals, including humans, dogs benefit from a balanced diet of all three of the macronutrients that provide energy – proteins, fats and carbohydrates. Discuss your pet’s needs at his annual check-up with your vet to make sure you’re addressing all of his dietary requirements. Generations of vets have been taught at school that dogs are omnivores. Their constitutions are built to digest foods containing carbohydrates, with ten key genes that act to digest starch and metabolize fat. Nonetheless, there’s no escaping the fact that a dog, like its close genetic relative the wolf, shows a strong tendency towards meat as its primary source of nutrition. This can be illustrated by their teeth, for instance, which are designed to tear and chop up meat in their mouths rather than grind plant material and grains from side to side like herbivores such as cows. Higher concentrations of stomach acid than herbivores have also allow for the faster digestion of animal proteins. Moreover, dogs have larger stomachs in relation to their size than herbivores do, to cope with fewer but larger meals. Overall, then, while dogs are capable of eating an omnivore diet, they show strong tendencies towards a carnivorous one. Why Do Dogs Need Protein? Dogs need 22 different essential amino acids, the building blocks of protein, to survive and live healthily. About half of these are naturally occurring within your pet’s body, but the remainder must be supplemented through their food consumption. Protein plays a range of roles in your dog’s health. Not only do proteins assist in the building and repair of the body’s tissues, but also they help in the formation of new skin cells, the growth of hair and repair and development of muscle. Protein is also an important ingredient for the creation of the enzymes and hormones; supplies the dog with energy; and helps support a strong and healthy immune system. Is Excessive Protein in Dog Food Bad for My Pet? As with humans, the general rule is that a balanced diet is the all-important factor. The other highly important factor that cannot be stressed enough is that every dog is different, and in deciding whether to give your pet a high protein diet, you will need to take his or her individual needs into account. There are some persisting myths around on the internet that suggest that a high protein diet is universally bad for canines, but this is not the case. “too much protein is just plain bad for a dog” – wild canines exist on a diet of meat they catch as prey, they do not survive on a diet of grasses and berries! So you’ll find no consensus among animal experts on the internet as to what constitutes ‘too much’ protein. In fact, dog’s bodies are built to digest and utilize nutrients from proteins. Of course, other macronutrients, i.e. carbohydrates and fats, are also important in terms of good health, so you’re looking for a balanced diet. But there is no scientific research to suggest that proteins constituting 30% or more of a dog’s overall diet will do them harm. “high protein diets will make your dog hyperactive” – there is no proven scientific link between hyperactivity and a high protein diet. “high protein diets are harmful to the dog’s kidneys” – it’s true that dogs with existing kidney conditions will benefit from a restricted protein intake, but there is no medical research to suggest that high levels of protein intake actually causes illness in an otherwise healthy pet. Can All Dogs Eat High Protein Diets? It’s easy to get confused with the huge range of dog foods out there, all promoting themselves as the best of their kind. The critical factor when making your decision about what to feed your dog is to recognize that one size definitely does not fit all. Consider your dog’s lifestyle, time of life and nature. Puppies, for instance, need a higher concentration of protein than fully grown canines because their bodies are growing. Working dogs or ones that have heaps of energy they need to burn off every day will have a greater requirement for protein than an older, lazy dog who’s content to sleep in front of the fire the majority of the time. Breed is also important, especially at puppy stage. Too much protein in the diet of a large breed dog can cause excess weight gain in a short space of time, which can put stress on developing joints and lead to conditions such as arthritis in future. And dogs with medical conditions such as kidney or liver disease should avoid too much protein, as this can cause additional stress on the organs, accelerating the progression of the illness. Take advice from your vet, and use information supplied by pet food manufacturers who have invested in research to formulate the best pet foods for your pooch at all stages in its life. Support of organ function, such as the liver and kidney, in healthy dogs. In summary, getting the right amount of protein in your dog’s diet is all about their individual requirements. In an otherwise healthy dog, there’s no need to assume that a high protein diet will be harmful, provided you ensure a balanced mix of the three main macronutrients overall. Consult your veterinarian for a guide on what to feed your furry friend, and then choose the right one for your pet from our list of the best high protein dog foods above!